As with squats, pause squats are among the best exercises there are for building quad, glute and hamstring strength and size. Pause squats will help you build explosiveness out of the bottom of your squat and off the floor with your deadlift resulting in bigger lifts. Pause squat technique is identical to squat technique, except that you pause at the bottom before driving the bar back up. Equipment: A squat rack and a bar is all you need. Using a power cage is nice, as you can set the safety pins to catch you if you fail and your spotter is unable to help you back up. Stance/Foot Position: You may need to adjust your stance based on your body proportions, build, and mechanics, but to maximize power and hit proper depth most easily start with a stance just outside shoulder width with your toes pointed outward. Hand Position: The closer you bring your hands in towards your shoulders on the bar, the tighter you will be able to keep your upper back. Grip the bar as closely to your shoulders as your flexibility allows. Bar Position: We’re training for power – place the bar low across the back of your delts. 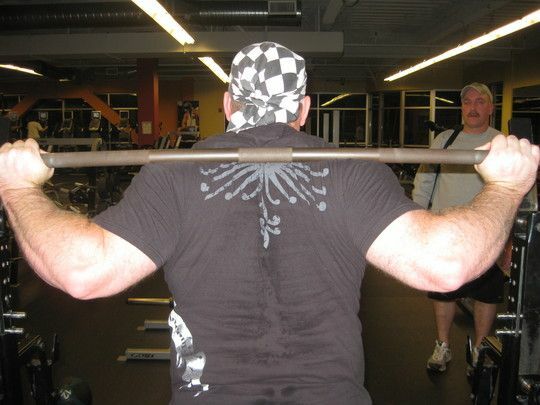 In the proper position you will find a small shelf between your traps and delts that locks the bar in place. Once you have your grip and have the bar positioned on your back, step under the bar. To unrack the bar, use a relatively close stance (hip width) similar to your conventional deadlift stance. Take a deep breath and rotate under the bar shifting your hips under the bar. Lift the bar straight up. Let the bar settle, and take one short step straight back. Move your other foot back and into your squat stance. Shift your first foot out to the side into your squat stance. Take a deep breath of air completely filling your lungs and tighten your core. Holding your breath, drive your knees out and sit down. Descend to the bottom of your squat at a quick, controlled pace. Try to descend to just below the parallel position for maximum glute activation. Pause at the bottom for two seconds before driving back up. If possible have your training partner or spotter count out loud and give you the ‘up’ command. On the ‘up’ command, drive your knees out and hips forward explosively. Begin to exhale once you are out of the hole, and complete the lift by locking out your knees and hips at the top. Keep your head and chest up and your back flat throughout each rep. Dropping your head can result in an excessive forward lean. Note: If you have mobility issues and your lumbar spine begins to flex at the bottom (lower spine curves inward), stop. Keep your depth above the point the flexion begins. Since you pause at the bottom of the squat, you will be unable to take advantage of the stretch reflex to rebound out of the hole. Pause squats will be more difficult than normal back squats, use somewhat lower weight than you use for your lighter weights. Partial Squats: Failure to squat at least to parallel reduces the effectiveness of your squats. You’ll maximize your hamstring involvement in the lift by squatting to parallel, and maximize glute activation by squatting below parallel. Excessive Lean: Leaning is a common mistake. If you lean forward it brings your hips up making it harder to hit depth. It can also take the tension off your legs where it should be and make your lower back do more of the work. Keep your head and chest up throughout each rep. Knees Buckling in: Allowing your knees to buckle in as you come up out of the hole will cause your hips to shift backwards forcing you to lean forward. It is a power killer. As you come out of the hole drive your knees out hard for more power and hip drive. Technique: Perform every repetition with proper technique. If you cannot complete your reps with proper form, reduce the weight. Keep you back flat during throughout each repetition. Taking a deep breath into your lungs and tightening your abdominals helps you keep your back flat as you squat. Spotter: Always use a spotter when you’re performing pause squats. Make sure your spotter knows what to do if you get into trouble. If you do get into trouble, stay with the bar and let your spotter assist you – don’t dump the bar on your spotter. For exceptionally heavy weights you may want to use three spotters. The two side spotters should only assist if your back spotter needs help. Pause duration: Increasing the duration of your pause increases the level of difficulty. Pause should range from two seconds to seven seconds. At seven seconds you will have absolutely no assistance from the stretch reflex– and holding your breath for seven seconds with a few hundred pounds on your back can be exceptionally challenging.